COWRA, AUSTRALIA - As dozens of spectators looked on at 2 a.m. on Aug. 5, three flares lit up the night sky over this small rural community in New South Wales, Australia, almost the exact time three shots rang out on the very same day 70 years before. Braving bitter cold, they were gathered in an open space to commemorate the 70th anniversary of the near-suicidal breakout from Cowra’s prisoner-of-war camp of hundreds of Japanese soldiers. The soldiers had been captured by the Allies in New Guinea and other islands to the north of Australia, despite having been indoctrinated under the Imperial Japanese armed forces military code never to be taken prisoner by the enemy. Their daring breakout on Aug. 5, 1944, a year before Japan’s surrender that brought World War II hostilities to a close, resulted in the deaths of 231 of those soldiers, most of whom were either shot or committed suicide, possibly to avoid the compounded shame of being taken prisoner twice. Four Australian soldiers also died. 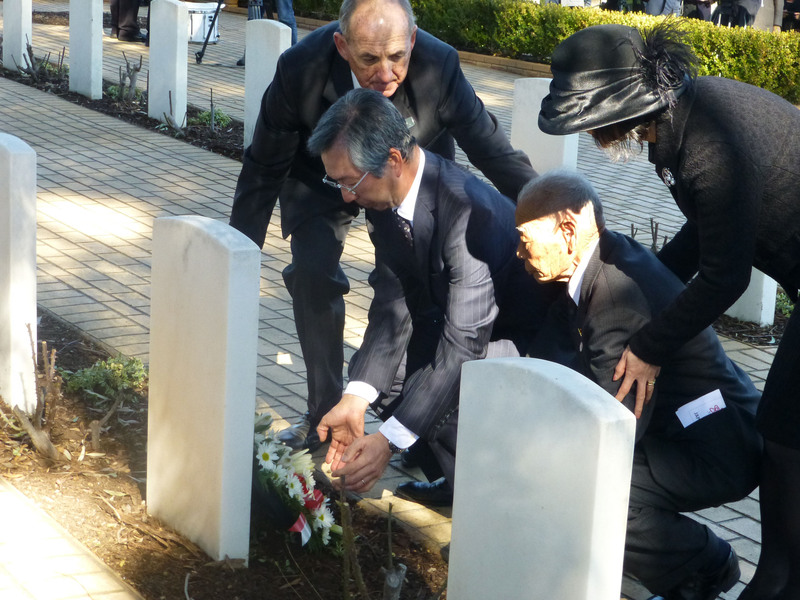 Cowra commemorated the event in a big way, with a five-day program of speeches and testimonies of former breakout participants, wreath-laying ceremonies, photo and art exhibitions, and even Japanese cultural activities. The three flares mirrored the three shots fired by Australian guards to warn of the breakout that morning by Japanese POWs, of whom there were around 1,100 at the camp. Among those attending the ceremonies was Teruo Murakami, a Japanese survivor now aged 93, who explained at a local high school how the Japanese POWs were secretly instructed by their group leaders in advance of the breakout to mark a piece of paper with either a circle or a cross to signal their support or opposition. “I drew a circle,” said the diminutive man of few words. It is said many of the prisoners were against the plan in the back of their minds but voted for it anyway. The POWs armed themselves with whatever was available, including forks and baseball bats. They put blankets over barbed wire to climb over the camp’s high fences. Murakami recalled how he fled along a road inside the camp and took refuge in a ditch as bullets flew through the air above his head. All the members of his group were caught. In the days that followed the breakout, those Japanese POWs who were not shot or did not kill themselves were recaptured and sent along with those who did not even make it out of the camp to a different one further inland. Bruce Weir, who was at the 70th anniversary commemoration, recalled how his mother, whose husband and son were away from home at the time, calmly offered the hungry men scones and tea, after having instructed her daughter to telephone the military to have soldiers come and pick them up. “She just sat them down on the veranda and she generally cooked scones for morning tea and she served them tea,” Weir, now 86, told the gathering at the high school. This act of kindness was immortalized in a photograph. One of those three Japanese in the first batch later visited the Weir family on the occasion of the 40th anniversary of the breakout, but was disappointed to learn that the woman who extended them such kindness had already passed away. Margaret was later invited to Japan where she gave her first-hand account of what happened at a symposium held for history teachers in Kurashiki, Okayama Prefecture. By not viewing the POWs as dangerous enemies but instead as fellow human beings desperately needing nourishment, Mrs. Weir’s selfless act has been seen as a basis of the reconciliation movement between Cowra and Japan. With Mrs. Weir’s legacy in mind, the local council has organized regular events to commemorate the POW breakout. “As a result of this effort an unprecedented friendship has been forged between Australian and Japanese people,” he said. Akimoto’s words of friendship at a peace bell ceremony were reflected later when a local runner, Jessica Banks, carried a special lantern lit by the ambassador and ran from the peace bell toward the Cowra Japanese Garden and Cultural Center. Banks then led a procession to the site of the POW camp, with participants carrying white paper lanterns with the kanji characters ‘Nihon’ or a picture of a peace dove. 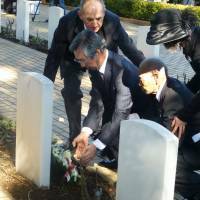 “The number of former POWs and Japanese visitors who have visited and continue to visit Cowra in recent years for this commemoration in the spirit of reconciliation and goodwill, is a testament to those warm relations,” she said. Bruce Stevenson, now 92, is also living proof of the ongoing closeness between the two countries. As a guard at a training camp located near the POW camp, he was assigned to look for POWs on the morning of the breakout. He called it “just one of the greatest feelings in my life” to be able to meet a former Japanese POW. He believes that the site means a lot to soldiers of both sides. With both men aged in their 90s, the 70th anniversary event may well be their last, but the Cowra council and community aim to ensure that the passage of time will not erase the collective memory of the breakout. Lawrance Ryan, chairman of the Cowra Prisoner of War Breakout 70th Anniversary Committee, said that plans for the 75th anniversary are already slowly being laid out.